Of your orange - very nice! It is food from Allah. Tasty grapes for you and me! Inside bits they look see-through! Your banana out it pops! Getting smaller, first it's tall! So your feet don't slip on it! Is the apple that we eat! Fruits can remind us of Allah. He is the One who made them for us to eat. When we eat them we should be thankful to Allah. We should say "Alhamdulilah" after we eat. Allah tells us about fruits in the Qur'an. 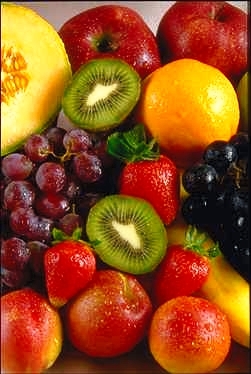 Can you name all the fruits in the picture to your left?